This video shows how to include both portrait and landscape orientation pages in a single Word document. This video shows how to include both portrait and landscape orientation pages in a single Word document. Lynda.com is now LinkedIn Learning! To access Lynda.com courses again, please join LinkedIn Learning. All the same Lynda.com content you know and love. 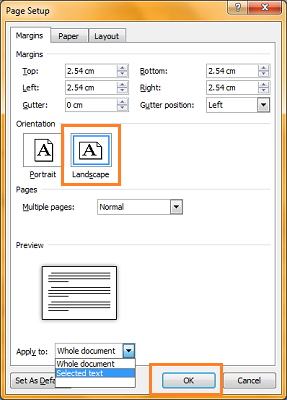 Plus, personalized course... 10/06/2010�� So when the user clicks on print, it will get printed in Landscape view and not portrait if your using RS 2008 then Report Menu ==>Report Properties ==>Page set up==>Paper size ==>orientation==>Landscape should do . 10/06/2010�� So when the user clicks on print, it will get printed in Landscape view and not portrait if your using RS 2008 then Report Menu ==>Report Properties ==>Page set up==>Paper size ==>orientation==>Landscape should do .